WHEN everyonea��s trying to think outside the box, these guys want to call the box their homea��the box (or panel) in a comic book that is. 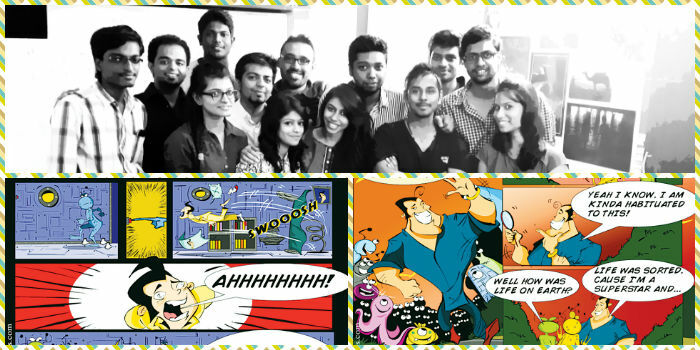 Digitally Inspired Media, the company that made a name for itself in Chennai with its 360 degree marketing and creative agency, is now expanding into the comic book arena with DI Comics. They have two comic book series readya��Alien Raja and JDGAF (Just Dona�?t Give A F***)a��and plan to launch them at the Mumbai Film and Comics Convention, slated for December 21-22.
a�?Being digital marketers, wea��re always on the lookout for new concepts and ideas. And with an enthusiastic and creative team, anything is possible,a�? says Surej Samil, one of the joint-heads of the teama��s business and creative processes. The others on the small yet innovative team are Vineed Ritchie, head of art and conception; Anurag Singh, Avinash Boopal and Meshach Thomas, who look after marketing; Raunaq Mangottil, the copy guy, and Manish Kishore, the other joint-head. a�?The comics industry has been around for a long time in India. However, new-age concepts and art have started being accepted only since the past few years. That is a positive sign of growth for the comics industry.a�? Their first effort is Alien Raja, a satirical web series targeted at young adults. The series sees a Bollywood superstar touch down on an alien planet, Utopia, and try to co-exist with its inhabitants. Ritchie, the artist heading the project, says, a�?The main aim to produce Alien Raja was to portray the stark difference between the a�?Perfect Worlda�� and a�?Our Worlda�?. So we make sure every story has a subtle moral behind ita��that talks of selfishness disrupting harmony.a�? The second series, JDGAF (pronounced /jay-dee-gaf/), is as rebellious as the name suggests. a�?JDGAF represents the countless years of suppression, oppression and depression, and the resultant attitude of not giving a f***,a�? says Salim. a�?We dona��t care about black, white, gay, fat, weird or absolutely mediocre. Wea��re all part of the same compost heap and wea�?re proud to be that way.a�? But he doesna��t want to give too much away because the series is set for release tomorrow. The event will also see the official launch of JDGAF merchandise (key chains, badges and coasters), themed on the new generationa��s bold outlook and attitude. Before signing off, Salim asks us to keep an eye out for their foray into gamification of Bollywood films and three new characters steeped in mythology. Speaking of how a�?superhero films never die and are an integral part for inspiration and imaginationa�?, Salim says that DI Comics offers character design, mascot creation, comics, sketches, storyboards, films, game concept arts, advertisements and illustrations. So a�?if therea��s a producer who is as crazy as us and devoted to the art form, why not take it to the next level?a�? Watch out Stan Lee!